The chronic inflammation of the gallbladder in most cases happens as a result of cholelithiasis (gallstones). The gallstones that are located within the gallbladder damage its wall and occasionally obstruct the normal flow of bile, causing the walls of the gallbladder to become more rigid. Overtime the gallbladder shrinks and loses its ability to store, concentrate, and release bile. Additionally, even if the patient with chronic cholecystitis doesn’t have gallstones at the onset of the disease, they usually form as the disease progresses, since constant inflammation of the gallbladder creates a favorable environment for the formation of gallstones. 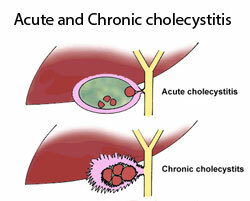 Another cause of chronic cholecystitis is infection, which is found in 60% of the cases. In the majority of cases the infection is caused by Escherichia coli, streptococci, and salmonella. Usually, the infection finds its way into gallbladder through the circulatory or lymphatic system, though sometimes it can come from the duodenum. Parasites, including pinworms, ascarids, liver fluke, and amoeba Entamoeba histolytica, can also cause chronic cholecystitis. Chronic inflammation is sometimes caused by retrograde flow of pancreatic enzymes into the gallbladder (oftentimes, this condition goes hand in hand with chronic pancreatitis). Congenital deformation of the bile ducts – this condition can prevent the bile from freely leaving the gallbladder, causing chronic irritation to its walls. Biliary dyskinesia – due to some unknown causes, the sphincter that regulates the release of bile from the gallbladder and the contractions of the gallbladder’s walls do not work in sync. This can create a buildup of pressure as the gallbladder contracts, but the sphincter is not yet open. Overtime this can lead to chronic inflammation. The cause of this condition is yet unknown, but it has been noted that a lot more children than adults have this condition. It has been hypothesized that this condition might be caused by the immaturity of the children’s nervous system. Physical damage to the gallbladder – physical trauma which a person can sustain in a car accident, a fight, etc. can lead to chronic inflammation of the gallbladder. Tumors located near the gallbladder and the bile duct system – tumors growing near the gallbladder can gradually compress the duct system, obstructing the normal flow of the bile from the gallbladder. Diabetes and atherosclerosis – atherosclerosis of the blood vessels that feed the gallbladder can reduce the blood flow, causing chronic hypoxia of the tissues and leading to chronic cholecystitis. Diabetes does the same thing as it promotes atherosclerosis of arteries all throughout the body. Poor diet (long breaks between meals) – it has been suggested that long breaks between meals can cause an overconcentration of bile within the gallbladder, which can cause irritation. Constipation and pregnancy – as a result of constipation or pregnancy the gallbladder or the duct system can become compressed. Allergic reactions – in rare cases an allergic reaction can cause the person’s own immune system to attack the tissues of the gallbladder causing a chronic inflammation. Older age – older age promotes the development of atherosclerosis which, as mentioned earlier, can decrease the flow of blood to the gallbladder, causing chronic inflammation.